It's been awhile and I'm so excited to get back in the groove of posting regularly. I know I mentioned it before, but I am in LOVE with the new blog design. 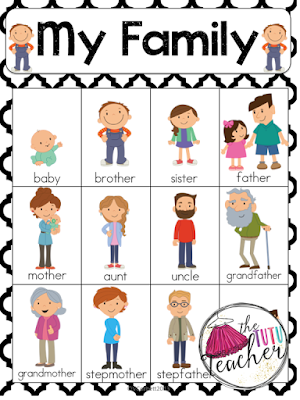 I wanted to share one way I try to help my kiddos talk about their families. We know that as children begin to develop a sense of their own identity, they look to their families as a way to solidify who they are, what their interests are, or who they will become. We talk about families all through the school year, but I like to revisit family vocabulary words during this time of year as students start to become stronger writers. As we work on narrative writing, my students want to know how to spell the names of the people who are featured in their stories. And while I encourage them to "sound out the words", or "do their best", I don't like the feeling of a child not being able to tell their story just because they are hung up on one word. 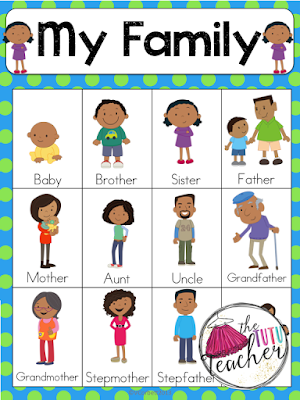 So, I created a set of family vocabulary cards that reflect different ethnicities. I will work on a set that contains interracial family members as well as a set with differently abled family members. Currently, I have a set of African American, Caucasian, Asian and Latino families. All four individual sets and the bundled pack are available in my TpT store.